Since we talked about camels here in the last post, here’s a simple verse from elsewhere for our next OGPS. წინამძღუარნო ბრმანო, რომელნი დასწურავთ კურნაქსა და აქლემსა შთანსთქამთ! ὁδηγοὶ τυφλοί, οἱ διϋλίζοντες τὸν κώνωπα, τὴν δὲ κάμηλον καταπίνοντες. Առաջնորդք կոյրք, որ զմժղուկս քամէ́ք, եւ զուղտս կլանէք։. W. Montgomery Watt, “The Camel and the Needle’s Eye,” in C.J. Bleeker et al., eds., Ex Orbe Religionum: Studia Geo Widengren, vol. 2 (Leiden, 1972), pp. 155-158. Régis Blachère, “Regards sur un passage parallèle des Évangiles et du Coran,” in Pierre Salmon, ed., Mélanges d’Islamologie, volume dédié à la mémoire d’Armand Abel par ses collègues, ses élèves et ses amis (Leiden, 1974), pp. 69-73. M.B. Schub, “It Is Easier for a Cable to go through the Eye of a Needle than for a Rich Man to Enter God’s Kingdom,” Arabica 23 (1976): 311-312. Samir Khalil, “Note sur le fonds sémitique commun de l’expression ‘un chameau passant par le trou d’une aiguille’,” Arabica 25 (1978): 89-94. A. Rippin, “Qurʾān 7.40: ‘Until the Camel Passes through the Eye of the Needle'” Arabica 27 (1980): 107-113. A similar phrase with “elephant” (pīlā) instead of “camel” appears in the Talmud: see Strack-Billerbeck, Kommentar, vol. 1, p. 828, and Sokoloff, Dict. of Jewish Babylonian Aramaic, s.v. qwpʾ. Some [say the word means] the rope of some apparatus, others [say it means] the animal [the camel]. Cyril of Alexandria, Fragment on Mt 19:24 (PG 72: 429) Κάμηλον ἐνταῦθά φησιν, οὐ τὸ ζῶον τὸ ἀχθοφόρον, ἀλλὰ τὸ παχὺ σχοινίον ἐν ᾧ δεσμεύουσι τὰς ἀγκύρας οἱ ναῦται. He says that kámēlos here is not the beast of burden, but rather the thick rope with which sailors tie their anchors. Cyril, Comm. on Lk 18:23 (PG 72: 857) Κάμηλον, οὐ τὸ ζῶον, ἀλλὰ τὸ ἐν τοῖς πλοίοις παχὺ σχοινίον. Kámēlos is not the animal, but rather the thick rope found in boats. With this Greek line from the Luke commentary we can compare the Syriac version, ed. Payne Smith, p. 338.15-17: gamlā dēn āmar law l-hāy ḥayutā mālon ellā l-ḥablā ʿabyā. ʿyāda (h)w gēr l-hānon d-šappir yādʿin d-neplḥun b-yammā da-l-hālēn ḥablē d-yattir ʿbēn gamlē neqron. He says gamlā, [meaning] not the animal, but rather a thick rope, for those who know well how to plow the sea are accustomed to call the very thick ropes that they use gamlē. One more place in Syriac attributed to Cyril has this interpretation, a few lines in the fragmentarily preserved work Against Julian (CPG 5233), ed. E. Nestle in Karl Johannes Neumann, Iuliani imperatoris librorum contra Christianos quae supersunt (Leipzig, 1880), here p. 56, § 21: d-qaddišā Qurillos, men mēmrā d-16 d-luqbal Yuliyanos raššiʿā. mqabbel hākēl l-taḥwitā: ḥrurā da-mḥaṭṭā w-gamlā, w-law ḥayutā a(y)k d-asbar Yuliyanos raššiʿā wa-skal b-kul w-hedyoṭā, ellā mālon ḥablā ʿabyā da-b-kul ellpā, hākanā gēr it ʿyādā d-neqron ennon aylēn d-ilipin hālēn d-elpārē. Cyril, from book 16 of [his work] Against Julian the Wicked. He accepts, then, the example: the eye of the needle and the gamlā, but not the animal, as the wicked, completely stupid, and ignorant Julian thought, but rather the thick rope that is on every ship, for thus those sailors who are expert are accustomed to call them. Theophylact of Ohrid, Ennaratio on Mt (PG 123: 356): Τινὲς δὲ κάμηλον οὐ τὸ ζῷόν φασιν, ἀλλὰ τὸ παχὺ σχοινίον, ᾧ χρῷνται οἱ ναῦται πρὸς τὸ ῥίπτειν τὰς ἀγκύρας. Some say that kámēlos is not the animal, but rather the thick rope that sailors use to cast their anchors. Suda, Kappa № 282: Κάμηλος: τὸ ζῷον. … Κάμιλος δὲ τὸ παχὺ σχοινίον. Kámēlos: the animal. … Kámilos a thick rope. Ps.-Zonaras, Lexicon: Κάμηλος. τὸ ἀχθοφόρον ζῶον. κάμηλος καὶ τὸ παχὺ σχοινίον, ἐν ᾧ δεσμεύουσι τὰς ἀγκύρας οἱ ναῦται. ὡς τὸ ἐν εὐαγγελίοις· κάμηλον διὰ τρυπήματος ῥαφίδος διελθεῖν. As mentioned above, Cyril’s report on the verse re-appears among other things in Bar Bahlul: ed. Duval, coll. 500-501, s.v. gamlā: gamlā tub maraš [sic! cf. maras]. ba-ṣḥāḥā Qurillos gamlā qārē l-ḥablā ʿabyā d-āsrin bēh spinātā. Moše bar Kēpā gišrā ʿabyā d-mettsim l-ʿel b-meṣʿat benyānē qārē gamlā, haw da-ʿlāw(hy) mettsimin qaysē (ʾ)ḥrānē men trayhon gabbāw(hy) w-taṭlilā d-a(y)k hākan gamlā metqrā. (ʾ)ḥrā[nē] dēn d-ʿal gamlā d-besrā w-da-kyānā rāmez wa-b-leššānā yawnāyā qamēlos metemar. (ʾ)ḥrā[nē] dēn āmrin d-gamlā haw d-emar māran b-ewangelyon sgidā — da-dlil (h)u l-gamlā l-meʿal ba-ḥrurā da-mḥaṭṭā — l-hānā gamlā d-ḥayy āmar, w-law d-a(y)k (ʾ)ḥrā[nē] šāṭrin l-gamlā. ba-ṣḥāḥā (ʾ)nāšin dēn āmrin d-šawšmāna (h)w arik reglē w-lā šarririn. w-gamlā b-meṣʿat ḥaywātā dakyātā w-ṭaʾmātā itāw(hy), b-hāy gēr d-metgawrar, men ḥaywātā dakyātā metḥšeb, wa-b-hāy d-lā ṣāryā parstēh, men ṭaʾmātā. A gamlā is also a rope [Arabic]. In one copy: Cyril calls the thick rope with which people tie their ships a gamlā. Moše bar Kēpā calls the thick beam people place at the top of buildings in the middle a gamlā, the one on which other pieces of wood are placed from either side, and a ceiling like this is called a gamlā. Others [say] that it means the natural animal [? lit. of flesh and of nature] gamlā (camel), and in Greek it is called kámēlos. Others say that the gamlā that the Lord mentioned in the Gospel — i.e., “it is easier for a gamlā to enter the eye of a needle” — by this he means a living gamlā, and not, as some foolishly say, a [non-living] gamlā [i.e. a rope, as in the interp. above?]. In one copy: Some people say that it is an ant with long, unstable legs. A camel is midway between the categories of clean and unclean animals: since it chews the cud, it is counted among clean animals, and since it does not split the hoof, among unclean. πάλιν δὲ λέγω ὑμῖν, εὐκοπώτερόν ἐστιν κάμηλον διὰ τρυπήματος ῥαφίδος διελθεῖν ἢ πλούσιον εἰσελθεῖν εἰς τὴν βασιλείαν τοῦ θεοῦ. դիւրին easy, light | մալուխ, -լխոյ rope (supposedly also “camel”; see note below) | ծակ, -ուց hole | ասեղն, ասղան, -ղունք, -ղանց needle | մեծատուն, մեծատան, -անց rich NB on մալուխ, see Lagarde, Armenische Studien, № 1404; Ačaṙean, 3.226-227; Künzle 2.437 says “Die Bedeutung ‘Kamel’ ist wohl durch diese NT-Stellen irrtümlich in die armen. Lexika eingegangen.” The proper Arm. word for camel is ուղտ, Lagarde, Arm. St., № 1760 (cf. MP uštar, NP uštur; Sanskrit उष्ट्र uṣṭra). Ad მერმე გეტყჳ თქუენ: უადვილესა ზომთსაბლისაჲ ჴურელსა ნემსისასა განსლვაჲ, ვიდრე მდიდრისაჲ შესლვად სასუფეველსა ღმრთისასა. PA და მერმე გეტყჳ თქუენ: უადვილეს არს მანქანისა საბელი განსლვად ჴურელსა ნემსისასა, ვიდრე მდიდარი შესლვად სასუფეველსა ღმრთისასა. At და მერმე გეტყჳ თქუენ: უადვილეს არს აქლემი განსლვად ჴურელსა ნემსისასა, ვიდრე მდიდარი შესლვად სასუფეველსა ცათასა. εὐκοπώτερόν ἐστιν κάμηλον διὰ [τῆς] τρυμαλιᾶς [τῆς] ῥαφίδος διελθεῖν ἢ πλούσιον εἰς τὴν βασιλείαν τοῦ θεοῦ εἰσελθεῖν. դիւրի́ն է մալխոյ ընդ ծակ ասղան անցանել. քան մեծատան յարքայութիւն ա՟յ մտանել։. Ad უადვილეს არს ზომსაბელისა განსლვაჲ ჴურელსა ნემსისა, ვიდრეღა <არა> [?] მდიდარი სასუფეველსა ღმრთისასა შესულად. PA უადვილჱს არს მანქანისა საბელი ჴურელსა ნემსისასა განსლვად, ვიდრე მდიდარი სასუფეველსა ღმრთისასა შესლვად. At უადვილეს არს აქლემი ჴურელსა ნემსისასა განსლვად, ვიდრე მდიდარი შესლვად სასუფეველსა ღმრთისასა. εὐκοπώτερον γάρ ἐστιν κάμηλον διὰ τρήματος βελόνης εἰσελθεῖν ἢ πλούσιον εἰς τὴν βασιλείαν τοῦ θεοῦ εἰσελθεῖν. դիւրագոյն իցէ մալխոյ ընդ ծակ ասղան անցանել. քան մեծատան յարքայութիւն ա՟յ մտանել։. Ad უადვილეს არს მანქანისსაბელი ჴურელსა ნემსისასა განსლვად, ვიდრე მდიდარი სასუფეველსა ღმრთისასა შესლვად. At უადვილეს არს მანქანისა საბელი ჴურელსა ნემსისასა განსლვად, ვიდრე მდიდარი შესლვად სასუფეველსა ღმრთისასა. Arm Again I say to you: it is easier for a rope to enter the eye of a needle than for the rich to enter the kingdom of God. A89 It is easier for a rope from a ship’s apparatus to go through the eye of a needle than [for the rich] to enter the kingdom of God. Ad Again I say to you: It is easier for a cable to go through the eye of a needle than for the rich to enter the kingdom of God. PA And again I say to you: It is easier for the rope of an apparatus to go through the eye of a needle than for the rich to enter the kingdom of God. Arm It is easier for a rope to pass through the eye of a needle than for the rich to enter the kingdom of God. Ad It is easier for a cable to go through the eye of a needle than for the rich to enter the kingdom of God. PA It is easier for the rope of an apparatus to go through the eye of a needle than for the rich to enter the kingdom of God. At It is easier for a camel to go through the eye of a needle than for the rich to enter the kingdom of God. Arm It would be easier for a rope to pass through the eye of a needle than for the rich to enter the kingdom of God. A89 It is easier for the rope of an apparatus to go through the eye of a needle than for the rich [to enter] the kingdom of God. Ad It is easier for the rope of an apparatus to go through the eye of a needle than for the rich to enter the kingdom of God. The earliest reading may well have been “camel”, but a change to “rope” does not really make for an easier reading: one can put a thread through a needle’s eye, but a rope will go through it no more than a camel will! In any case, some traditions clearly side with “rope”, such that those traditions’ commonest readers and hearers of the Gospel passage would have known nothing of a camel passing through the eye of a needle, only a rope, and apparently one large enough to handle marine functions! There is no early evidence among the sources above for “camel” in Georgian (or Armenian), while Greek knows both, as does Syriac (via Greek sources, to be sure). This variety of readings, attested without a doubt, adds to the richness of the textual witness of the Bible and the history of its interpretation. There are probably further exegetical and lexical places in Greek, Syriac, Armenian, and Georgian that bear on this question of what we’re dealing with here, a camel or a rope, but this is, I hope, at least an initial basis for some future work on the question for anyone interested. Er sah den Pawle herankommen, einen Mann, wie das Wort ihn ihm dargestellt hatte: klein von Wuchs, kahl auf dem Kopf, krummbeinig, langnasig, mit zusammengewachsenen Augenbrauen. He saw Paul as he was approaching: a man, as the word had depicted to him, small in statue, bald-headed, bow-legged, long-nosed, with close-knit eyebrows. I’m sure there are others (I’ve not managed to easily locate the passage above in the Greek Metaphrastes), but for comparison, there is another description of Paul’s appearance from a Greek synaxarion, June 29 (ed. Delehaye, cols. 779-780). UPDATE (16 Sept 2015): Goguaże’s ed. now available at TITUS here. I have previously discussed an episode in the Syriac version of the story of Barbara in which a shepherd and his flock are mutated into beetles. As I mentioned there, in the Greek version, the sheep become beetles (κανθαρίδες), but the shepherd himself becomes a stone (λίθος). I also noted that the synaxarion texts in Arabic and Gǝʿǝz lack this episode entirely. Since then I have looked at two other sources: an Arabic version from a manuscript I cataloged, and the Armenian version in Vark’ ew vkayabanut’iwnk’ srboc’, vol. 2, and here is what I have found. Իսկ հայրն իբրեւ զարիւնարդու գազան՝ ելեալ [p. 359] վարէր զհետ նորա. Saint Barbara, having gone out, was fleeing from her father, but he, like a bloodthirsty animal, was pursuing her. And he went out to the mountain and searched for the blessed Barbara, and just then he saw on the mountain two shepherds, who were tending their flocks, and he was asking them whether they might have seen her. One of them wanted to lie for her, lest the saint fall violently and be killed, and he swore to him, “I don’t know at all where she might be, nor will I be able to spot her.” But his companion began to indicate and make signs so as to point out Christ’s handmaid. The saint, then, having cursed him, (namely) this wicked shepherd, and he immediately having coagulated, he, together with the sheep, became like a statue, like Lot’s wife, and it remains to this day in that very form: they remain petrified in the same place for a sign to those who see it. And when her wicked father realized that she had gotten the better of him by the power of her great Lord, he made a thorough search for her and went up the mountain after her. That mountain was enough for two [shepherds] to tend sheep, and he asked them about her. One of them swore that he had not seen her. Satan entered the heart of the other as he had entered the heart of Judas, who handed Christ over to the Jews: thus [the second shepherd] handed the chaste woman into her father’s hand. Then she lifted her gaze toward that shepherd who had pointed her out to her father and she cursed him, and he and his flock became black rocks, [remaining so] to this very day. This data is of course not based on a complete examination of surviving sources for this story, not even for the languages included here. In all likelihood a more thorough investigation would reveal even more variety across the versions of this text, as well as some clues as to when and whence the different metamorphoses manifest in these texts. վտանգիմ, -եցայ to be in danger, peril, etc. And as they were bringing him to the place [of his martyrdom], he spread his hands to heaven and said: Lord, my God, creator of heaven and earth, father of our Lord Jesus Christ, hear and fulfill my request. Watch over this city and cleanse it of idolatry. Remember, too, all your people: cleanse [them] of idolatry and cure every infirmity. Be a comforter to the afflicted, a helper to orphans and widows, a visitor to those in prison. Bring those who have suffered shipwreck on the sea to the haven in peace. [Be] a fellow traveler to wayfarers, a refuge to those put to flight by the violent. Free those in peril in slavery. Cast out demons from humanity. Raise up the fallen. Bring back those who are astray. Grant forgiveness to sinners. Impede satanic intentions. Open your kingdom to all who believe in you, those who will build a church in my name, take up the relics of my bones, or celebrate my commemoration. Grant them your infinite mercy. Do not let satanic temptation come upon them, nor violence from foes or magistrates. And receive my spirit in peace. Mit seiner Fingernägeln zerkratzte er ihm sein Gesicht. He was scratching his face with his fingernails. αὐτῇ τῇ ὥρᾳ ὁ λόγος συνετλέσθη ἐπὶ Ναβουχοδονοσορ, καὶ ἀπὸ τῶν ἀνθρώπων ἐξεδιώχθη καὶ χόρτον ὡς βοῦς ἤσθιεν, καὶ ἀπὸ τῆς δρόσου τοῦ οὐρανοῦ τὸ σῶμα αὐτοῦ ἐβάφη, ἕως οὗ αἱ τρίχες αὐτοῦ ὡς λεόντων ἐμεγαλύνθησαν καὶ οἱ ὄνυχες αὐτοῦ ὡς ὀρνέων. მასვე ჟამსა შინა აღესრულა ნაბუქოდონოსორის ზედა, და კაცთაგან განიდევნა, და თივასა ვითარცა ზროხაჲ ჭამდა, და ცუარისაგან ცისა ჴორცნი მისნი შეიღებნეს, ვიდრემდე თმანი მისნი ვითარცა ლომისანი იქმნნეს, და ფრცხილნი მისნი ვითარცა მფრინველისანი. Finally, one more verse with nails/claws came to mind: Lev 11:4. So we have three texts, one a manuscript citation of an unpublished text (at least as far as I know) in a lexicon, and two from the Bible, all stemming from one word: ფრცხილი and its variant ფრჩხილი. I hope it’s obvious that these lexical and textual chains can be instructive for language-learners and philologists generally. I learned earlier this week from a tweet by Matthew Crawford (@mattrcrawford) that the Rabbula Gospels are freely available to view online in fairly high-quality images. This sixth-century manuscript (Biblioteca Medicea Laurenziana, Plut. 1.56) is famous especially for its artwork at the beginning of the codex before, surrounding, and following the Eusebian canon tables, including both figures from biblical history and animals: prophets, Mary, Jesus, scenes from the Gospels (Judas is hanging from a tree on f. 12r), the evangelists, birds, deer, rabbits, &c. Beginning on f. 13r, the folios are strictly pictures, the canon tables having been completed. These paintings are very pleasing, but lovers of Syriac script have plenty to feast on, too. The main text itself is written in large Estrangela, with the colophon (f. 291v-292v) also in Estrangela but mostly of a much smaller size. Small notes about particular lections are often in small Serto. 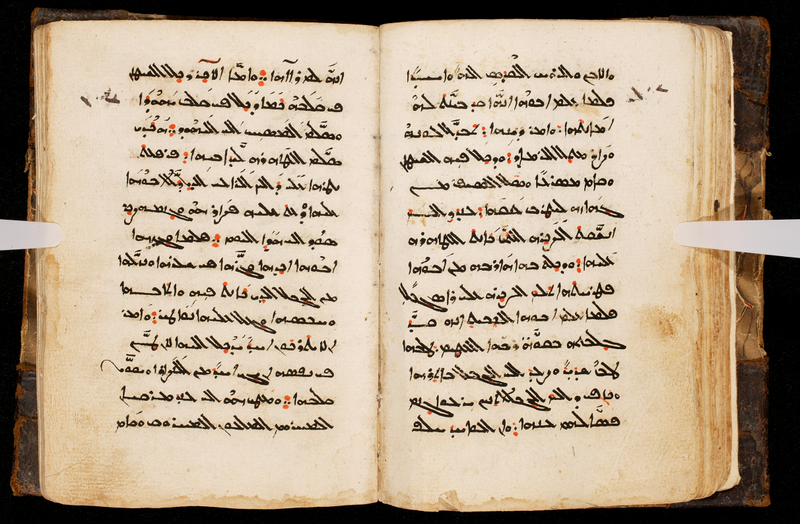 The manuscript also has several notes in Syriac, Arabic, and Garšūnī in various hands (see articles by Borbone and Mengozzi in the bibliography below). 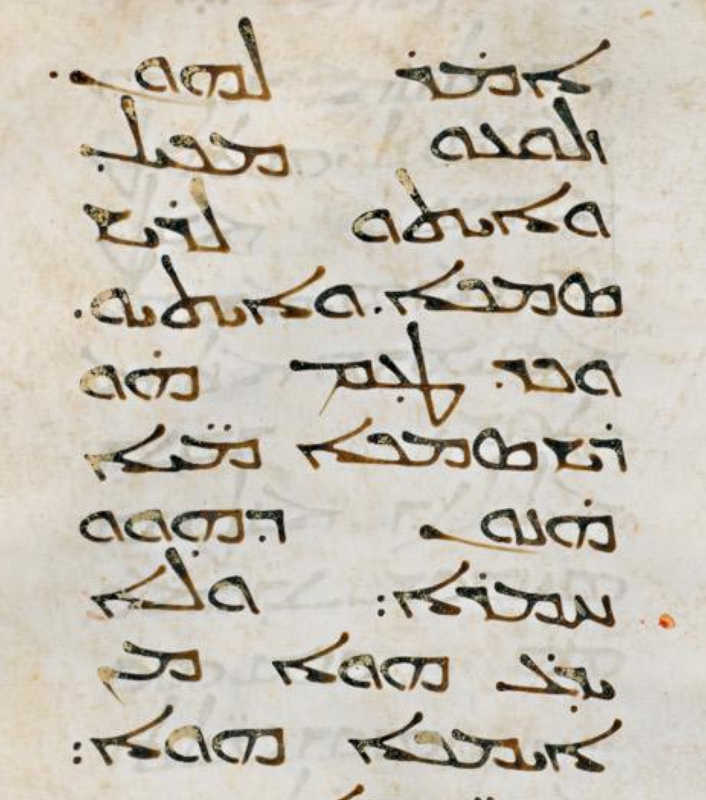 From f. 15v to f. 19r is an index lectionum in East Syriac script. The Gospel text itself begins on f. 20r with Mt 1:23 (that is, the very beginning of the Gospel is missing). Rabbula Gospels, f. 231r, from the story of Jesus’ turning the water into wine, Jn 2. Rabbula Gospels, f. 5r. 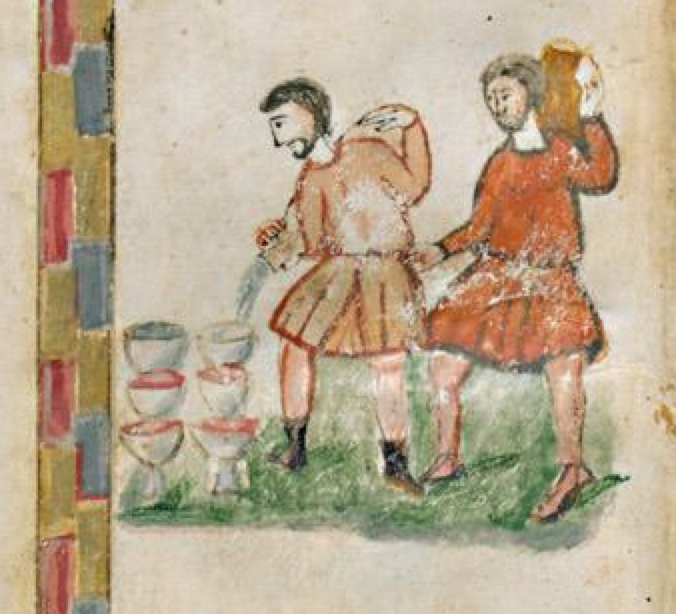 The servants filling the jugs with the water that will become wine. Bernabò, Massimò, ed. Il Tetravangelo di Rabbula: Biblioteca Medicea Laurenziana, Plut. 1.56. L’illustrazione del Nuovo Testamento nella Siria del VI secolo. Folia picta 1. Rome, 2008. A review here. Bernabò, Massimò, “Miniature e decorazione,” pp. 79-112 in Il Tetravangelo di Rabbula. Bernabò, Massimò, “The Miniatures in the Rabbula Gospels: Postscripta to a Recent Book,” Dumbarton Oaks Papers 68 (2014): 343-358. Available here. Borbone, Pier Giorgio, “Codicologia, paleografia, aspetti storici,” pp. 23-58 in Il Tetravangelo di Rabbula. Available here. Borbone, Pier Giorgio, “Il Codice di Rabbula e i suoi compagni. Su alcuni manoscritti siriaci della Biblioteca medicea laurenziana (Mss. Pluteo 1.12; Pluteo 1.40; Pluteo 1.58),” Egitto e Vicino Oriente 32 (2009): 245-253. Available here. Borbone, Pier Giorgio, “L’itinéraire du “Codex de Rabbula” selon ses notes marginales,” pp. 169-180 in F. Briquel-Chatonnet and M. Debié, eds., Sur les pas des Araméens chrétiens. Mélanges offerts à Alain Desreumaux. Paris, 2010. Available here. Botte, Bernard, “Note sur l’Évangéliaire de Rabbula,” Revue des sciences religieuses 36 (1962): 13-26. Cecchelli, Carlo, Giuseppe Furlani, and Mario Salmi, eds. The Rabbula Gospels: Facsimile Edition of the Miniatures of the Syriac Manuscript Plut. I, 56 in the Medicaean-Laurentian Library. Monumenta occidentis 1. Olten and Lausanne, 1959. Leroy, Jules, “L’auteur des miniatures du manuscrit syriaque de Florence, Plut. I, 56, Codex Rabulensis,” Comptes-rendus des séances de l’Académie des Inscriptions et Belles-Lettres, Paris 98 (1954): 278-283. Leroy, Jules, Les manuscrits syriaques à peintures, conservés dans les bibliothèques d’Europe et d’Orient. Contribution à l’étude de l’iconographie des églises de langue syriaque. Paris, 1964. Macchiarella, Gianclaudio, “Ricerche sulla miniatura siriaca del VI sec. 1. Il codice. c.d. di Rabula,” Commentari NS 22 (1971): 107-123. Mango, Marlia Mundell, “Where Was Beth Zagba?,” Harvard Ukrainian Studies 7 (1983): 405-430. Mango, Marlia Mundell, “The Rabbula Gospels and Other Manuscripts Produced in the Late Antique Levant,” pp. 113-126 in Il Tetravangelo di Rabbula. Mengozzi, Alessandro, “Le annotazioni in lingua araba sul codice di Rabbula,” pp. 59-66 in Il Tetravangelo di Rabbula. Mengozzi, Alessandro, “The History of Garshuni as a Writing System: Evidence from the Rabbula Codex,” pp. 297-304 in F. M. Fales & G. F. Grassi, eds., CAMSEMUD 2007. Proceedings of the 13th Italian Meeting of Afro-Asiatic Linguistics, held in Udine, May 21st-24th, 2007. Padua, 2010.Available here. Paykova, Aza Vladimirovna, “Четвероевангелие Раввулы (VI в.) как источник по истории раннехристианского искусства,” (The Rabbula Gospels (6th cent.) as a Source for the History of Early Christian Art) Палестинский сборник 29  (1987): 118-127. Rouwhorst, Gerard A.M., “The Liturgical Background of the Crucifixion and Resurrection Scene of the Syriac Gospel Codex of Rabbula: An Example of the Relatedness between Liturgy and Iconography,” pp. 225-238 in Steven Hawkes-Teeples, Bert Groen, and Stefanos Alexopoulos, eds., Studies on the Liturgies of the Christian East: Selected Papers of the Third International Congress of the Society of Oriental Liturgy Volos, May 26-30, 2010. Eastern Christian Studies 18. Leuven / Paris / Walpole, MA, 2013. Sörries, Reiner, Christlich-antike Buchmalerei im Überblick. Wiesbaden, 1993.
van Rompay, Lucas, “‘Une faucille volante’: la représentation du prophète Zacharie dans le codex de Rabbula et la tradition syriaque,” pp. 343-354 in Kristoffel Demoen and Jeannine Vereecken, eds., La spiritualité de l’univers byzantin dans le verbe et l’image. Hommages offerts à Edmond Voordeckers à l’occasion de son éméritat. Instrumenta Patristica 30. Steenbrugis and Turnhout, 1997. Wright, David H., “The Date and Arrangement of the Illustrations in the Rabbula Gospels,” Dumbarton Oaks Papers 27 (1973): 199-208.